Imagine being kidnapped and transported back in time to a 16th century French castle. Amelia Augusta Ethrington, 18th century Duchess of Abbington, is considered by society an old maid at thirty-two. She refuses to marry and relinquish her title to a husband. Instead, she finds romance in trysts with total strangers. 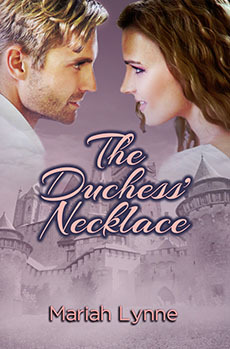 Amelia’s claim to her duchy is an intricate and valuable necklace, The Abbington Jewels. An unscrupulous time traveler, wishing to steal the jewels and sell them at future prices seduces her, catching her off guard, while snatching the necklace. Amelia must Travel with the aid of a gypsy seer to find the scoundrel, kill him, and retrieve her necklace before her jealous male cousins lay claim to her duchy. Complications arise when she meets Ryan Redstone, a museum appraiser sent to acquire the jewels. Amelia falls in love but knows she must focus on regaining her necklace. Amelia is faced with the most difficult decision of her life. Love in the present? Or defending her honor in the past? How dare she? How dare that woman, a common baker’s wife in drab brown rags no less, speak to me with such disrespectful tones? Her whiney voice echoed in my mind long after I left her shop. “Hope you know what a lucky lady you are, ma’am, what with all your servants and that lovely necklace. Why those emeralds and diamonds sparkle brighter than the stars in our night sky. ’Tis fit for her majesty herself.” She then took her hand out of her pocket and pointed her wrinkled finger moving it so close to my jewels she almost touched them. I took a quick step back, livid at her boldness, and left without speaking a word. If I had a farthing for every time a commoner told me how lucky I was to be a royal, I would need a room in the manor to hold all of the coin. They tell me how they envy my servants, my sprawling estate, and my valuable family heirlooms. Why? Because they only see the good, but there is a downside, especially for an 18th century woman like myself, looking for true love. There I sat, fourth in line for the throne, a born and bred duchess with the highest bloodlines, lonely and growing older by the minute. Men of my standing leave my bed, defiant, refusing to return. They say they found me too free spirited, too intelligent, and much too unwilling to relinquish authority to my duchy to them, even by marriage. I realize I am not the heroine our love poets wrote about. I have the same desires as any other woman, maybe even a few more, but am left to fulfill them in secret trysts with men I wouldn’t be seen with in public. One day, however, a curious set of events would change all that. The next afternoon, I was sleeping as sound as a newborn when short, loud, popping noises shook me from a dream. Pistol shots? Why? Who? Startled, my heart raced. I gasped trying to catch my breath. My thoughts spun like a whirling dervish as I forced myself upright to listen for any other noises. I waited. There were none. A few minutes passed before I heard screaming female voices break the eerie silence. Frenzied chatter from outside followed before the downstairs pendulum clock chimed three times. Three in the afternoon and I’m still in bed? Peculiar. I pride myself as an early riser. Fear caused a sudden cold draft to chill my neck. I looked down at my sheer nightshirt. Odd, it was unbuttoned down to my waist. For some unknown reason, I felt compelled to touch my neck. My necklace! Why on earth didn’t I have it on? I never take it off. I stood rushing to my bed stand to open the top drawer. Not there. Anxious, I then combed through every inch of the bed sheets. It’s not here. Not anywhere. What will I do? My necklace is gone. Panic left me breathless. My stomach became uneasy as I began to feel lightheaded. I slumped down into the high back chair next to the window trying to regain my composure. I hoped to remember whatever I could about where I may have left it. When I felt better, I stood and looked under my bed. I searched under the cushions of my chair. I still couldn’t find it. How could I be so careless? My necklace . . . my inheritance . . . my sole claim to my royal estate and title of duchess; how could it vanish in a flash? I tried several times on the ride back to discover why, but Mr. Whitely remained tight lipped. Once at the manor, I dashed up to my mother’s bedroom only to find her pale and desperately ill. She had been my pillar of strength since we lost my father in a hunting accident. I loved her with all my heart. I cried collapsing in his arms. My heart was broken. She was too young to die. I was sixteen much too young to lose my mother. I pulled myself together and walked over to her bedside. Putting on a brave smile, I kissed her forehead. She squeezed my hand. Frail as she was, she murmured something about my lineage I had not been privy to before. She told me how the king himself bestowed upon our ancestor his own neck chain to serve as a symbol in breaking the tradition of royal lineage thereby guaranteeing that whoever wore the necklace bore our ducal title and owned the estate. Because of His Highness’s most generous gesture, I, a woman, could assume title ahead of my male heirs, my cousins. I gave her my word both as her daughter and now Duchess I would guard that necklace with my life. My mother, content with my promise, closed her eyes and died at peace. At that profound moment of grief, I vowed to myself never to wear my weakness on my sleeve ever again. To take charge of this duchy requires strength. Today, however, my Mum must be tossing over in our family mausoleum. As my memory began to clear from a sleepy stupor, I remembered my affair with that cheeky scoundrel, Stuart Minton, that lying gigolo from a future time I invited back for afternoon tea. I’m quite sure he was the thief who stole my royal jewels and perhaps my future. I couldn’t forgive myself, my mind still reeling at how and why I removed that chain? I always double fastened the clasps and never took my necklace off! For the sake of a romantic tryst with a handsome stranger, I squandered my estate, broke my promise to my mother, and relinquished my place in line to the British throne all in that one reckless act. How could I be so careless? What was I thinking? Was the pleasure of my flesh more important than my duty to my title and the servants who worked the manor and farm? If my greedy male cousins, Thaddeus and Ernest, my sole heirs to the duchy, ever find out about my missing necklace, they will be only too happy to lay claim to my inheritance and share the title. I know more than anyone how they loathe relinquishing power to a woman and still hold resentment and jealousy in their hearts because their male ancestor had been denied the necklace and thus the title for bad behavior. With no necklace in my possession, the Abbington lineage would then revert back to the eldest male of each generation. I turned to face my bedroom doorway just as I heard the door burst open. Madeleine, my maid, rushed in. Her normally neat brown hair had fallen from its usual braided wrap. Her starched white apron stained with spots of blood. Her red eyes stared into mine as if for help. I would do anything for her—anything. She has been with me so long, I considered her family. Madeleine held up her apron to wipe her eyes. I realized then that one of my guards had been killed. I needed to know more but did not want to ask. I let her tell me. “Minton paid no heed and kept going. Your brave guard drew the sword from his belt, but that dreadful man turned around and shot him. Arthur fell to the ground gasping for air. We all rushed in to assist him but he bled so furiously, we realized there was little hope for his recovery. I knelt next to him and gently raised his head to my lap. All I could do was offer comfort. Arthur gasped before pointing toward the sky. ‘That man,’ he said in between labored breaths, ‘disappeared into thin air.’ He then closed his eyes and died peacefully in my arms. Madeleine struggled to compose herself as she wiped more tears from her eyes. I handed her one of my hankies. My mind continued to punish me. How could I let Arthur’s death happen on my watch? Why did I let my guard down and allow Minton into my life and bed only to have him steal my necklace? Shock confused me. I needed to pull myself together in order to find that murderous scoundrel and make him pay for Arthur’s death. But I knew in order to carry out my plan, my first priority must remain my necklace. Without my title, I was no help to anyone. If that murderer sold it to either Thaddeus or Ernest, before he left, my claim to the duchy was null. I walked over to my maid and held her, desperate to console her grief. I knew I had to be careful of my answer. The tone of my voice led Madeleine to believe my method of travel was nothing extraordinary, but in fact my journey would take me to another time and a foreign place. Madeleine curtsied and left to find a proper dress for my trip. My mind wandered, still disturbed by the recent tragedy. I realized if I were to find this murderous charlatan, I must travel to Minton’s time. My personal seer, Alden, could not assist me with this. I knew I had to call on a known Traveler’s friend from the future, Starr Knight, a gypsy with all the talents of a seer. Alden recommended her to me three years ago, when I lost my precious King Charles Spaniel Duke. Anxious about my journey, I walked over to my nightstand and picked up the miniature painting of Duke as a puppy. My late mother’s friend, Lady Ethan, who made miniatures of all royal babies in the duchy, had painted Duke. She chided me that at her age and with my independence, she doubted if she would live long enough to see me bear a child. As I looked at his sweet face for comfort, my mind, still a bit hazy, drifted back to a certain Traveler and that most horrible day. Most Travelers prove themselves to be good citizens, but a few have not been so virtuous. No matter. The Travelers I have encountered have always been a thorn in my side. Unfortunate as it was, Duke had a horrible run in with one of the devious ones. England as well as our beloved village has long been a favorite destination for Time Travelers for all sorts of reasons. At one point, these visitors were flooding into our hamlets at such a rate the king had to put a stop to it or their numbers would destroy our quality of life. He decreed that only eight Travelers at a time would be allowed into each shire for one year’s apprenticeship. All Travelers are from future times and most anxious to learn the ways of our master jewelers, porcelain and china designers, and silversmiths so they can duplicate these skills in their own time. It seems their wealthy patrons admire the work of the English craftsmen from my time. The artisans of Abbingtonshire are well known in all of our land and beyond for their beautiful, original, and intricate designs. All the hopefuls’ names and dates of birth must be entered by their personal wizards in a lottery for all of the shires to be drawn by His Majesty’s royal sorcerer. Of course, most names drawn requested Abbingtonshire, not just for of our rolling green hills, ancient rock Roman walls, and superior craftsmen, but because we had a special offering of particular interest to them. Once the eight names had been selected, they were sent to our local Bishop. His councilmen then questioned and approved each Traveler upon arrival before sanctioning their stay. Our council is most strict at sorting out their motives and appropriateness for study. The Bishop of Abbington and our council hold with the highest regard their vows to provide for the poorest in our hamlet. Several years ago, our local council by formal proclamation decreed that Travelers shall be provided room and board in the church annex, as well as guaranteed apprenticeships with our best tradesmen in whatever field they so choose. It is well known that our craftsmen are the best in all of England, but what truly separates us from the other hamlets in a Traveler’s eye is this generous welcome endowment. Once approved, Travelers must honor our good will by swearing to a secret arrangement where they shall bring us ten pounds of sterling along with a donation of goods and crafts in their own field from their time. These coins and gifts are either given to our poorest citizens directly or placed in a holiday sale which proceeds assist our poorer residents. The incoming Travelers must first be sworn to secrecy by their seers; their pledges bound in writing then sent to The Bishop of Abbington who places his holy seal upon the document. In the past, they have brought bedding, cookware, clocks, as well as tins of delicious chocolates, cookies and toys for the children. The Travelers are pleased to donate and enjoy celebrating the holiday with us at Abbington Cathedral decked out in its holiday greenery and yule candles for our Carol Service. Because of this secret exchange, our hamlet parish now believes it has the richest alms for the poor fund in all of England. It even assists our farmers and non- skilled laborers. The other church councils still scoff at us advising that accommodating Travelers in such a generous manner depletes our hamlet’s reserves and is a guaranteed way to lose church funds and raise tithes. But since they are not aware of our secret pact, they have no idea how much money our special program truly brings in. We intend to keep it that way. Our funds are so great that the church vestries can negate the tithing of locals offering full apprenticeships and reduce those of the other residents. Of course, townspeople are notified yearly of all Travelers serving as apprentices and always try to keep a watchful eye on them to guarantee they do not abuse the rules of their stay. I’m afraid my guard, Edward, was not so diligent on that fateful day and because of that, I experienced heartache like never before. Duke was a very special pup, not just because he was mine, but because our king gave him to me from his own dog’s litter. Black and tan, Duke caught the eye of every dog fancier. Aware of their interest, I kept a tight watch over him. I smiled, remembering I named him Duke because I never romanced a man with whom I wished to share my title. Duke was playing in his private fenced in garden as unbeknownst to me a known time Traveler to our village watched from a nearby stonewall. At any rate, my guard, Edmund, whom I sent to protect Duke, rushed inside the manor house, breathless. He ran in and out of the drawing room and dining room before he found me in the library reading. When I noticed Duke was not with him, I stood, hands trembling in fear that something awful had happened. I was speechless. When Edmund told me that my Duke was missing, my heart shattered into tiny pieces. I was devastated and couldn’t bear the thought of living without my precious pet. I wiped my tears, ordering Edmund to go into the village center to find out what he could about this heartless thief. Prior to this day, no one had reported this Traveler as devious. I hoped he would ask for a ransom. I would pay dearly but alas that was not to be. I paced the library floor crying my eyes out. I would do anything to get my Duke back. My guard returned later that day to report the local tavern owner had informed him this Traveler mentioned, after a few too many ales, that he was a breeder of King Charles Spaniels from the time of 2010. He was searching for one with the purest bloodline to take back to his time for breeding. There were none purer than my Duke unless he stole the king’s own dog. I continued to weep, fearful that my little Duke was gone forever. I called for Madeleine and asked her to find my personal seer, Alden. It was not very long before Madeleine returned with Alden. Just seeing my kind old seer gave me strength. Alden had long fine white hair and a long gray beard. He limped over to me using a walking stick. He stopped and took my hand as he looked into my eyes with his sympathetic ones. I trusted Alden with all my heart so I decided to Travel to meet Starr. Anxious about what I had to do, I looked deep into Alden’s dark brown eyes. Alden nodded, looking pleased by my answer. Of course I did what my trusted seer said. He positioned me with my back against the wall while facing the opposite wall that held the large painting of my manor gardens. Shaking, I stood there waiting for further instruction. My stomach felt unsettled as I waited to see what would happen next. Finally, I turned when I heard a whisper of a sound as soft winds entered the room. They were the winds of time strengthening as they approached. Without warning, they picked me up and swirled me around. Their robust gusts blew the window open before lifting me through it high into the clouds. I was deathly afraid to open my eyes for fear of falling. After I calmed down, I spread my arms out wide, drifting back and forth like a hawk in flight. I felt a bit dizzy before the winds dropped me all too suddenly in a corner of what I came to know as Starr’s front yard. Lucky for me, she was starting a flowerbed and had just placed a fresh mound of soil right where I landed. That made for a much softer landing than I anticipated. I stood and shook the topsoil from my garments before looking around. The air was much warmer than I was accustomed. Stifling, I stopped to unbutton the top of my blouse. It was night and lucky for me no one was nearby to see. That was precisely why I was here. I ran up the green wooden steps and knocked on her front door’s stained glass window. It was a few minutes before she answered, but those minutes seemed like hours. Starr opened the door. I looked into her kind eyes. There she stood. Nothing like I imagined. No fancy robes of a seer, no amulet or magic wand. She was dressed like a peasant in light colored sequined fabric of rose and lavender. Her skirt was much shorter than proper length for a lady while her long hair was tied back in a blue scarf. I looked up into the most caring eyes I’d ever seen. She took my hand and escorted me inside. She escorted me down a short hallway before entering a pleasant looking room. I walked over to a large round table covered with a blush lace tablecloth. I peered around the pale pink room, looking at all the pictures of happy couples dressed in wedding regalia on her wall and all the cats and dogs with their smiling owners. Oh, how I hoped her next picture would be of Duke and me. Starr pointed to a chair. “Please sit down here next to me, and I promise I’ll see what I can find out.” A pitcher with two glasses was on a tray next to her. Starr filled the glasses. I was thirsty indeed and took a sip as I watched her turn around. She opened the bottom of the mirrored sideboard behind her. She took something solid out and placed it on the table in front of her. At first, I paid no attention. I was so dry and the chilled tea so delicious, I gulped down the rest of the glass before I saw what it was. There, right in front of my eyes, stood a most exquisite pink crystal ball. Any of the seers in my duchy would have vied for such an article of pure beauty. Starr glanced over at me, moving one finger over her mouth to indicate I should be quiet. I couldn’t talk since I was taken aback by a soft cherry glow coming from the center of her crystal ball. Waving her slender fingers around the ball, Starr closed her eyes and spoke Duke’s name slowly with conviction. As soon as she finished, colored lights in different shades of pink and blue exploded from her crystal ball circling the walls. They mesmerized me as Starr kept working her magic. The lights flickered before they stopped. Starr gasped.